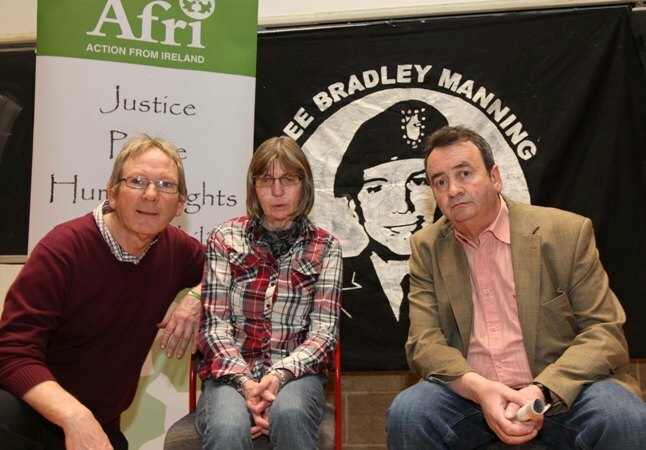 Afri became involved in the ‘Free Chelsea Manning’ campaign when peace activist Ciaron O’Reilly organised for Chelsea’s family, who have strong Irish connections in Kerry and Dublin, to make a visit to Ireland. We organised a programme of events including a public meeting in Trinity College attended by Chelsea’s mother, aunts and uncle and addressed by Chelsea’s aunt Sharon as well as by the former Guildford 4 member, Gerry Conlon. That was an evening of deep emotion: Gerry Conlon, tragically no longer with us, spoke with his trademark passion, principle and anger at how legal and political systems in Britain had crushed his own life and extinguished the life of his father, Guiseppi Conlon. He praised the courage of Chelsea Manning and lamented the fact that there was no similarly brave whistle-blower in the British system when he and his father and Maguire relations were incarcerated on completely spurious charges. As a result of that visit to Ireland, Donal O’Kelly was inspired to initiate the Manning Truthfest, consisting of artists, musicians and activists who crossed the Irish sea in the Spring of 2014 and 2015 and again in the Autumn of 2016 to sing songs and play music in solidarity with Chelsea and her Welsh-based family and to protest the inhumanity of the 35 year sentence imposed upon her. Afri was a central part of this extraordinary seaborne solidarity! The commutation of Chelsea’s sentence is perhaps the best thing that Barack Obama will have done in office. But Chelsea, together with tens of thousands of other US soldiers, should never have been in Iraq, where they have succeeded only in laying waste to the country and its people. And Chelsea should never have been in prison in the first place. It is unclear as to whether Chelsea passed through Shannon airport en route to war but she may well have done, and this illustrates the utter moral bankruptcy of successive Fianna Fáil, Fine Gael, and Labour party governments who gratuitously handed over our country, and Shannon in particular, to warmongers. The name of Ireland is forever tarnished as a result of our collusion in ‘resource wars’ fought for the enrichment of corporate interests. The consequence of the opening up of the Pandora’s box of war in Iraq and elsewhere is being seen now in the desperate, incessant and often doomed flight of refugees from the Middle east and elsewhere. So while Chelsea Manning can hold her head high as a result of an act of heroic courage and a singular commitment to truth, back-boneless members of successive Irish governments, who choose to deny the reality of Shannon’s role in the war machine, should hang their heads in shame while contemplating Chelsea’s message: ‘I prefer a painful truth over a blissful fantasy’.